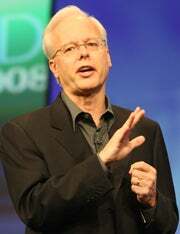 Timing is everything, Microsoft's Ray Ozzie told a crowd in Seattle last week. Ten thousand hours' worth of time, to be precise. Ozzie, Microsoft's chief software architect, figures that he and Bill Gates may have put in the 10,000 hours it takes to become an expert -- according to the rule in Malcolm Gladwell's popular book "Outliers" -- at about the same time. He and Gates were both born in 1955 (as was Apple CEO Steve Jobs), and both began playing around with computers at about the same time. "I know Bill and I started at almost exactly the same time, freshman year in high school, both using GE Time-sharing computers," said Ozzie during a lunch event in Seattle on Friday. Putting in about 20 hours a week during the school year and an astounding 60 hours a week during summers and at college, he figures he accumulated his 10,000 hours by his sophomore year at university. "Which is exactly when the hobbyist aspect of the PC industry kind of took off," he said. "Once you master technology you can start to think about other aspects like user scenarios. So the next 10,000 hours can be spent in a slightly different way," he said. The idea of a benchmark for the amount of time required to become an expert in something was popularized in Gladwell's book, in which he discusses how expertise requires more than just innate ability. He says researchers found that 10,000 is a magic number of sorts for the amount of time experts spend developing their craft. Many tens of thousands of hours later, Ozzie believes we are at a significant point in the evolution of technology, and a moment he has been working toward for many years. "There's never been a more exciting time because so many of the problems we've tried to solve, they all failed based on one simple thing, which was that everybody didn't have a computer and the ones that did weren't connected," he said. "This should be the golden age of computer-based cooperative work and social interacting." Ozzie, who is perhaps best known for his work on the development of Lotus Notes, said his interest in collaborative software stretches back to his first job. "I got into collaborative software and systems because of the tremendous juxtaposition of two very extreme things I was exposed to concurrently," he said. The first was his discovery during college of PLATO (Programmed Logic for Automated Teaching Operations), a series of networked computers that were designed for teaching but available to hobbyists during off hours. Enthusiasts used it to build interactive games and online communities. "People met each other and got married," he said. Then Ozzie got his first real job out of college at Data General. "I was stunned by how boring it was. Where are the people? There were no people in the equation," he said. He and other PLATO enthusiasts went on to try to recreate the collaboration and social interaction that PLATO first enabled, he said. Along with Craig Mundie, Ozzie now handles the software strategy responsibilities that used to be held by Gates, who now spends most of his time heading his philanthropic foundation. Ozzie is taking his collaboration ideas a step further, to include a kind of collaboration among the devices owned by a single person. Microsoft's goal is to let people store information online and access it from a variety of devices, including PCs, mobile phones and TVs. "We aren't conceptualizing Office as a PC product anymore, even though obviously it still is," he said. Instead, Microsoft is increasingly hosting its software online, where people can access it from a variety of devices. Friday's luncheon was hosted by the Technology Alliance, a group that promotes technology education and entrepreneurship in Washington. Ed Lazowska, the chairman of the University of Washington's computer science and engineering department, interviewed Ozzie at the event.